In North Carolina the American alligator inhabits fresh and estuarine bodies of water as far west as Robeson and Cumberland Counties, building dens with submerged entrances at the water's edge. Alligators are concentrated in the lower Cape Fear and Neuse River Valleys but roam over much of the Coastal Plain south of the 36th parallel, which splits Albemarle Sound lengthwise. A few atypical creatures, such as the one evicted from a golf course near Kings Mountain, penetrate far into the Piedmont. Escaped pets, including spectacled caimans imported from the tropics, account for some sightings. 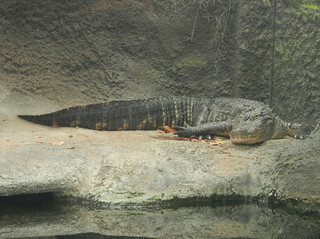 Alligator populations are greatest in places with restricted human activity, such as military bases and state and federal parks, but the stress of living around the northern limits of their range has limited the animals' survival, growth, and reproduction in North Carolina even in these areas. Consequently, the species has not responded as well to official protection in North Carolina as in other southern states. Nevertheless, alligators are useful predators and are believed to help maintain healthy environments for fish and other wildlife in the lakes and ponds they inhabit (in particular, by retarding the eutrophication of these bodies of water). Exactly how far north alligators once ventured is difficult to assess. William Byrd, who traversed the Great Dismal Swamp in 1728, mentioned tales of the species there but did not record direct sightings. Alligators have left their mark on North Carolina geography, however. Named for them are two bays in Onslow and Brunswick Counties; two river branches in Columbus and Brunswick Counties; five creeks in Brunswick, Camden, Carteret, Pamlico, and Tyrrell Counties; a lake in Hyde County; a river and a swamp in Brunswick County; a township in Tyrrell County; the Great Alligator Dismal Swamp, which covers much of the Albemarle-Pamlico Peninsula; and other land forms in the state. Bernard S. Martof and others, Amphibians and Reptiles of the Carolinas and Virginia (1980). American Alligator, Kure Beach, NC, 2011. Image courtesy of Flickr user Travis S. Available from http://www.flickr.com/photos/baggis/6132627042/ (accessed August 2, 2012).